Sharing technical and processes improvement tips and techniques since 1999! Getting Started with Nintex’s Salesforce.com Connector! CRM) for Nintex Workflow last month. Whether you’re new to SalesForce.com (which I will refer to as SFDC going forward so that my fingers don’t go numb and / or bleed due to typing out SalesForce.com a gazillion times), like me, or it’s old hat to you, you may be interested in how you can now integrate your SharePoint content and other LOB data with SFDC easily with Nintex Workflow. The new SFDC Connector consists of 11 new actions and, coming later (Q3 ’14) this year, bidirectional mechanism for starting Nintex workflows from activities inside of SFDC! In my next post, I will point out some helpful resources in your journey toward SFDC & Nintex bliss as well as how the actions are actually configured and used in your workflows. Create a record (standard or custom object). This could be used to add a new account to your SFDC instance. Delete a record (standard or custom object). Query a record (standard or custom object). Retrieve a record (standard or custom object). This would allow for all of an accounts details (e.g. name, account number, address, phone, etc.) to be pulled in one fell swoop to a dictionary. Update a record (standard or custom object). Could be used to update specific fields (a new phone number perhaps) for an account. Attach a file to a post on Salesforce Chatter. Post a link to Salesforce Chatter. Post a message to Salesforce Chatter. Use this action to post a polls to Salesforce Chatter to conduct a survey. The poll appears in a feed posts, and allows people to cast a vote on a specific question. Search for feeds in the Authorizing user’s Salesforce Chatter network. Send an invitation to users who do not have a Salesforce license to join the Authorizing user’s Salesforce Chatter network. Invitations are limited to users that have an email address within your allowed domains, and “Allow Co-worker Invitations” must be enabled for your organization. 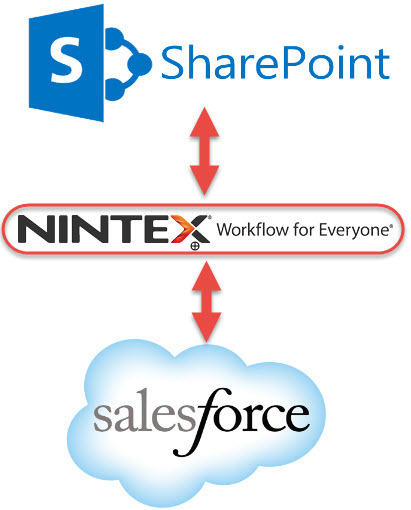 You will need to add the SFDC Connector via the Nintex Live Store. You can trial the SFDC Connector (and all of the above actions) for 30 days via your Nintex Workflow for O365 designer right now. My counterpart, the amazing and handsome Vadim Tabakman, was kind enough to put together a quick video on how to add them. Check it out! That’s all for now, but stay tuned! The step by step SFDC action walk-through will be posted shortly! New features (DocuSign, SalesForce.com, etc) and events (Ask the Experts) oh my! Between a fair amount of events (SKO’s, WPC and more! ), I’ve been all over the place the past few weeks but I felt now would be a great time to stop and synthesize (Good Lord, how I love corporate double speak!) all of the great stuff I’ve been exposed to over the past month with everyone! First, lots of great things happened at WPC. Nintex announced a partnership with DocuSign. Wow. Looks like @MikeFitz and I are having way too much fun @WPC! Well what this means for our loyal Nintex customers (NOTE: The action can be added to the Nintex designer at no cost but a valid DocuSign account will be required to configure and utilize the action. So go sign up for a trial today!) is that you can now easily integrate the ability to send your documents wholesale (or merge SharePoint metadata with a document template in the cloud) to anyone in the world, regardless of whether or not they are a DocuSign customer, to collect their digital signature. Along with this signature is other metadata such as geolocation tagging and more. So, with regulatory and ‘auditability’ needs to address, I can’t think of an easier way to manage digital signatures as part of a business process automation solution (Some scenarios could include; HR on-boarding and performance reviews, sales and procurement contract negotiations, press releases, etc., etc.). Below is a list of the actions that will be available over the next few weeks! This allows you to remove all of the documents associated with a specific DocuSign envelope. Send a document to a specific party to be signed. The nice thing about having this action inside of Nintex Workflow is that the recipient can be dynamically populated! With this action you can take a previously populated envelope and forward it to a specific party for signing. In my next post I’ll be covering the new SalesForce.com connector and all of the juicy new actions that are sure to make integrating your SharePoint practice with SFDC a breeze. 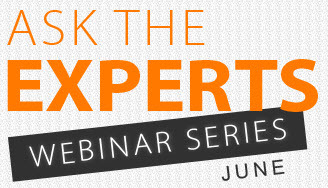 Lastly, make sure you tune in tomorrow (7/29/14) for our July edition of the Nintex Ask the Experts webinar! Sign up now! Questions about BPA (business process automation) or workflow? Well then, we can help! When it comes to automating business processes or even just evaluating a business process to determine if it should be automated, my counterpart (the venerable Vadim Tabakman) and I are often asked; How do I perform X action? What if I want to pass Y data along to a specific person or system? Whenever I get a widget order, I want to make Z happen but only when / if A, G and M have occurred, how do I do that? 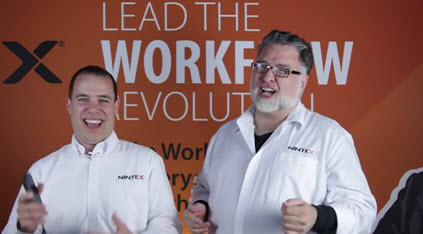 Well the answer to those burning questions and any others related to how you can leverage Nintex Workflow to solve these business challenges can be yours for the low, low price of 60 minutes of your day! Just go ahead and click on the image or link below to submit a question and sign up for our Ask the Experts webinar where we will be answering your questions next week during the live webinar!